Age 50, of Pittsburgh entered into eternal rest to be with his Mom and Dad on Friday, April 5, 2019. Jeffrey is survived by his loving brothers, Kevin (Lorie) George and Ronald (Gail) George. Uncle of Christopher George, Nicole (Joe) Thoma, Kristina Gramz, Dana (Bob Gildea) George, Adam (LaReina ) George, and Ronald George; as well as 6 great nieces and nephews. He was preceded in death by his Parents, Phillip Arthur, Sr. and Mary Katherine Long George and his Brother, Phillip Arthur (Karen) George, Jr.
Jeffrey was born with cerebral palsy and endured many struggles but had a fulfilling life spent with family and friends. He had an infectious smile and a stubborn personality. Jeff loved to watch game shows his favorites were Family Feud and Deal or No Deal, listening to country music and being outside. 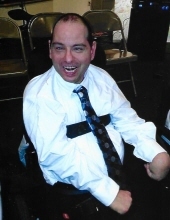 The family would like to express our sincere and heartfelt appreciation to the actual caregivers who truly provided Jeff with the care and attention that he needed and those who made him smile and helped him enjoy life. Visitation will be held on Tuesday, April 9, 2019 from 2 to 4 pm & 6 to 8 pm at the JEFFERSON MEMORIAL FUNERAL HOME, INC., 301 Curry Hollow Rd., Pleasant Hills, 15236. A Blessing Service will be held Wednesday, April 10 ,2019 at 12 pm in the funeral home's chapel. Condolences may be left at www.jeffersonmemorial.biz. To send flowers or a remembrance gift to the family of Jeffrey Lynn George, please visit our Tribute Store. "Email Address" would like to share the life celebration of Jeffrey Lynn George. Click on the "link" to go to share a favorite memory or leave a condolence message for the family.